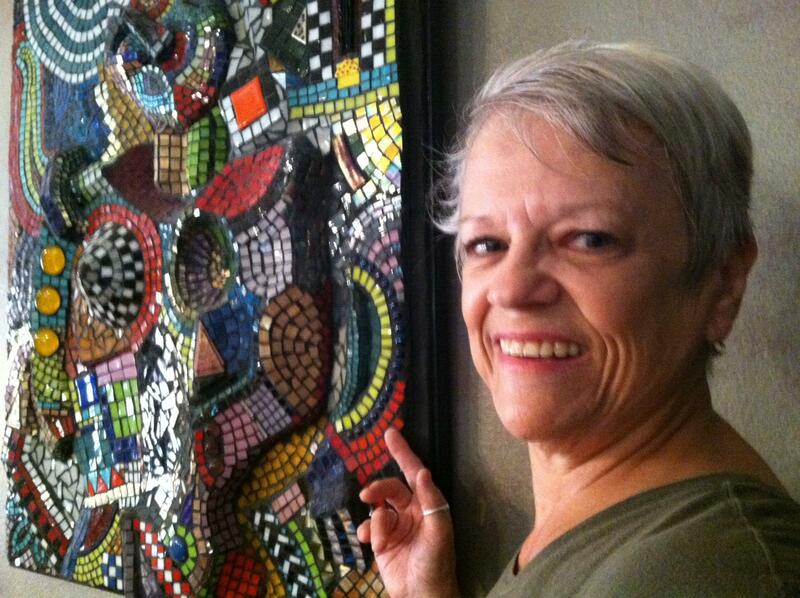 Clearwater mosaic glass artist Carole Haberkorn next to her self-portrait. 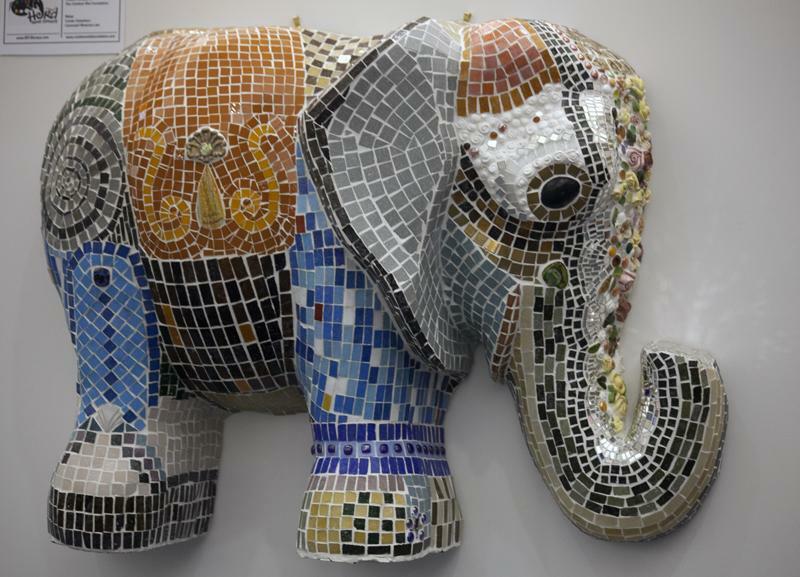 Carole Haberkorn's glass mosaic tiled elephant created for the "Elephants Herd Around Tampa Bay" art project in honor of the RNC. 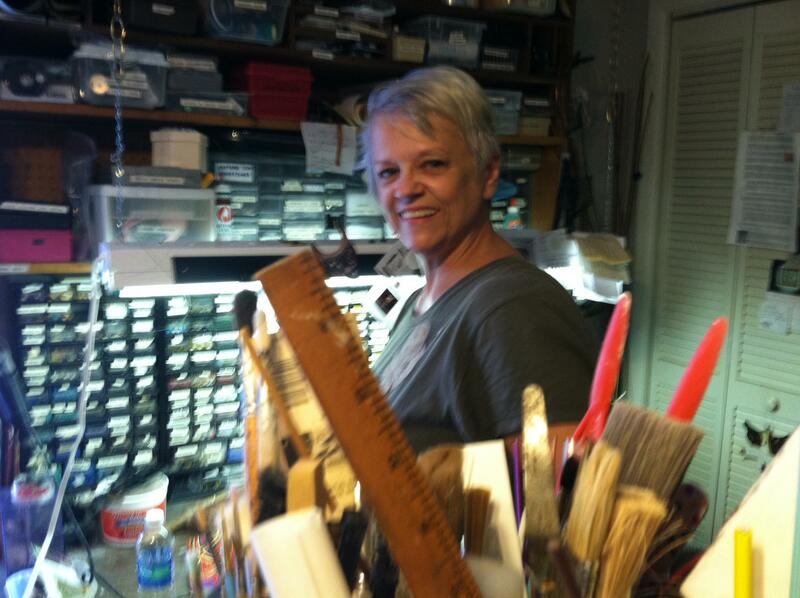 Haberkorn has an art studio equipped with two kilns at her Clearwater home. 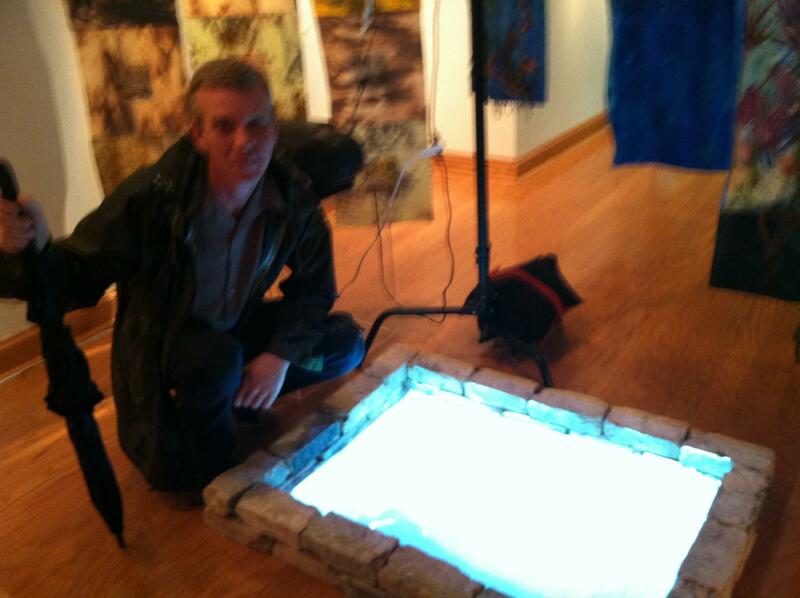 Video artist Stewart Kincaid kneels next to his "sand pool" - framed by bricks - that reflected his video of manatees in the Hillsborough River. 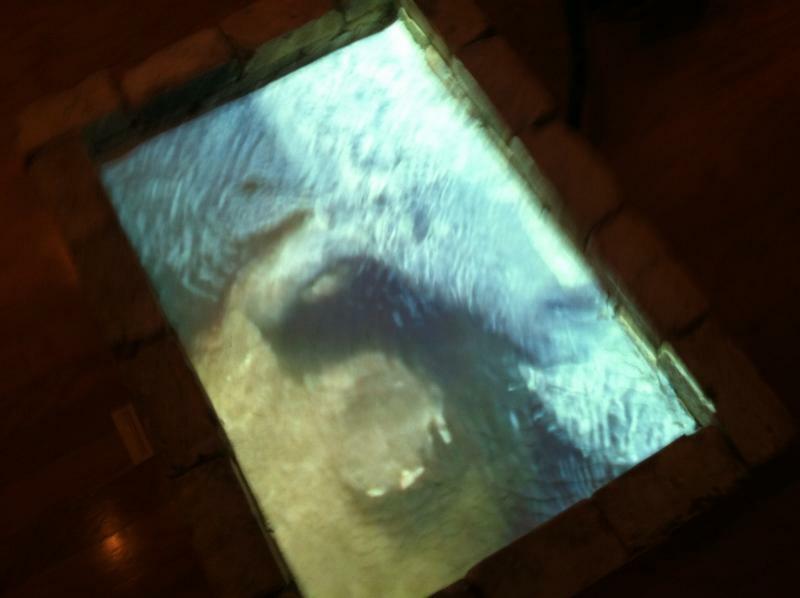 Reflections of a manatee from a video projection into a pool of white sand. The art installation was part of the 2012 Tampa Cuban Sandwich Show. Elephants are iconic Republican and they’re also the closest living relative to the Florida manatee according to the Florida Wildlife website. So, it seemed only natural that the animal kingdom duo be the focus of our RNC art coverage. First, the “Elephants Herd About Tampa Bay” art project. It gave 29 artists a chance to adorn, embellish and festoon fiberglass, elephant sculptures. Clearwater glass mosaic artist Carole Haberkorn wanted to be part of the pachyderm parade. She participated in a similar sea turtle project 12 years ago. It took some doing, but Haberkorn got her elephant but with less than two weeks to create her 70 pound vision. “I did not want to go with red, white and blue. I thought it was going to be a cliché though I did put red white and blue on one foot,” Haberkorn said. Her homage to the American Flag is at the bottom, front foot of her elephant relief sculpture. Its trunk is decorated with multi-colored ceramic roses. Mosaic swirls of black and gray glass tiles accent the elephant’s ears and hind quarters and its massive legs are covered in shades of blue. The crowning feature: shards from a broken, decorative vase atop the elephant’s head. “What I did is what I always do - I like to make it colorful, innovative, fun and I want comments I want people to look at it and say or nay,” Haberkorn said. And if elephants represent Republicans in the animal kingdom --- it’s fair to say manatees represent Florida. And an installation by artist Stewart Kincaid featured the slow moving aquatic mammals that early explorers supposedly mistook for mermaids. “These guys are the original inhabitants of this area and I was hoping that people would see this and remember this is not just us here,” Kincaid said. Kincaid mainly works with music and performance art, but for the 2012 Tampa Cuban Sandwich Show, he produced a video. Manatees appear below rippling water as if swimming inside a pool of white sand, framed by bricks on the studio floor. It is quintessential Tampa says David Audet – artist and co-curator. Art that represents Tampa is the only criteria needed to be part of Audet’s Tampa Cuban Sandwich Show. And that’s his genius according to Luis Guitarti, creator of the blog Art Taco. Tampa now can add hosting the 2012 Republican National Convention to that list.